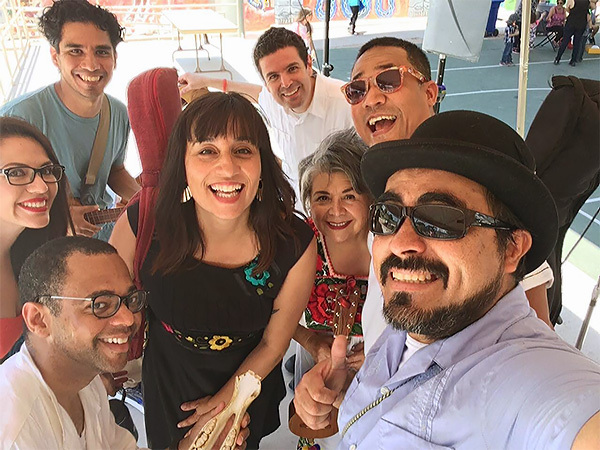 Michelle Téllez first heard the lively harmonic sounds of son jarocho music at a community concert in Los Angeles. The band playing was Mono Blanco, a well-known troupe from Veracruz, Mexico. It was just the beginning of what she would come to love about son jarocho, a style of folk music from Veracruz, Mexico that blends indigenous, Spanish, and African musical styles. “The syncopations, the African rhythms, the lyricism, the conversation, the stories, the relationship to the natural world, it has such long history. I wanted to know it,” said Téllez, founder of the Son Jarocho Collective in Tucson. 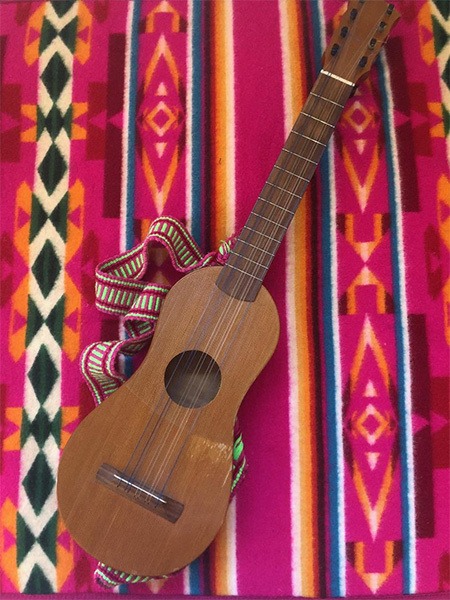 The form takes its name from the word son for “song,” which is central to the form, as singers often narrate stories or improvisationally exchange versus called décimas, and to the word jarocho, which refers to someone or something from the state of Veracruz, Mexico. Its primary instrument is a jarana, small, eight-stringed guitar. Most people know something of the sound from the song “La Bamba,” a folk song from the son jarocho tradition made popular in 1958 by Ritchie Valens. Son jarocho is also considered a music of resistance. “It underwent a renaissance in the 1980s, working against the erasure of regional music practices and traditions by the commodification of culture in broader Mexico,” Téllez said. That garnered interest from Chicano communities in the United States, who were also working to not be consumed by popular culture. The music helped her to find community when she moved to Arizona from California several years ago. “In California, there were many son jarocho learning communities, but in Arizona, there was nothing. So we had to start it,” she said. While the learning community originally started in Phoenix, she kept the group going when she later moved to Tucson. 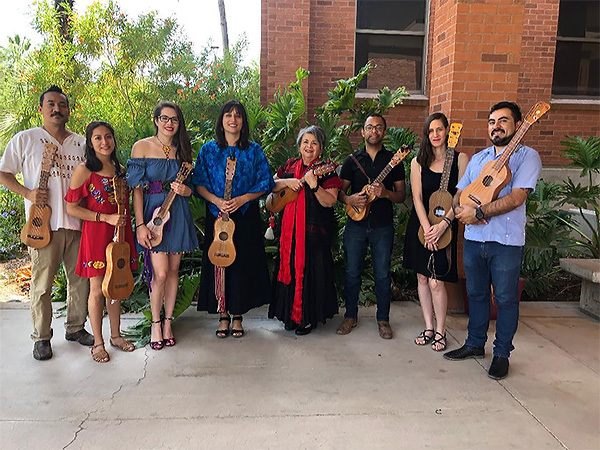 Today the Son Jarocho Collective meets every other Sunday in Tucson and provides a place for people to learn both the music and dance. Several times a year, the Collective invites Hector Vega, a maestro originally from Veracruz currently residing in Hermosillo, to offer workshops. Phil Williams, a member of the Collective, said the music has helped him find community as well. Originally from Indiana, Williams was in Chicago training to become a pediatrician when he heard son jarocho music at a folk music festival. Soon after he bought a jarana and started meeting others who played. Given his own interest in social change and activism, he felt at home with the people he met, who were politically and socially conscious, he said. “I got hooked by not the just music but the whole scene. I am African American from Indiana who is a non native Spanish speaker, but I was learning. I was new to stringed instruments so took a few months to figure it out with lessons once or twice a week,” Williams said. He went five years without playing much, then randomly saw a post on Facebook from Tellez about a ‘meet and greet’ with a son jarocho musician in Tucson happening an hour later. “I jumped in my car and drove there,” he said. He’s been playing with the Collective ever since. The influence of African rhythms in the music reminds Williams of the diverse cultures present in Mexico. “That translated for me, especially since I am a transplant to Nogales, an area that I have grown to consider my home and my family,” he said. In October the Son Jarocho Collective will benefit from a workshop with Mono Blanco, one of the headliner acts performing at Tucson Meet Yourself this year. He says in this musical form even the greats are humble. “This artform is all about sharing,” Williams said. The Collective will also collaborate with flamenco and son jarocho artists from Tucson, Phoenix, Albuquerque, El Paso, and Hermosillo, in “Taconazo!” for TMY After Hours event that celebrates the art of zapateado, or the tapping of tacones, heels, on a wooden surface. Son Jarocho Collective has a public Facebook page here. Here’s a link to a video of the Collective at a recent celebration. Mono Blanco performs Friday and Saturday nights, Oct. 12 & 13 at Tucson Meet Yourself. View the schedule here.